Ah, Rome. Is there a city more beautiful or more replete with beautifully dressed people? This editor has a hard time thinking of one. (Sorry, Paris.) However, I'm also the first to admit that all of that sartorial goodness can make figuring out what to wear on your next trip there more than a bit of a challenge. Nailing that local flair while staying comfortable as you trek from the Trevi Fountain to the Colosseum and everywhere in between is the ultimate packing challenge. Luckily, Instagram is here to help. The app is a wellspring of Roman holiday inspiration, so if you are feeling stuck while gearing up for your next trip, it's a great place to start. That is, after this story because we've rounded up what to wear in Rome for every season. 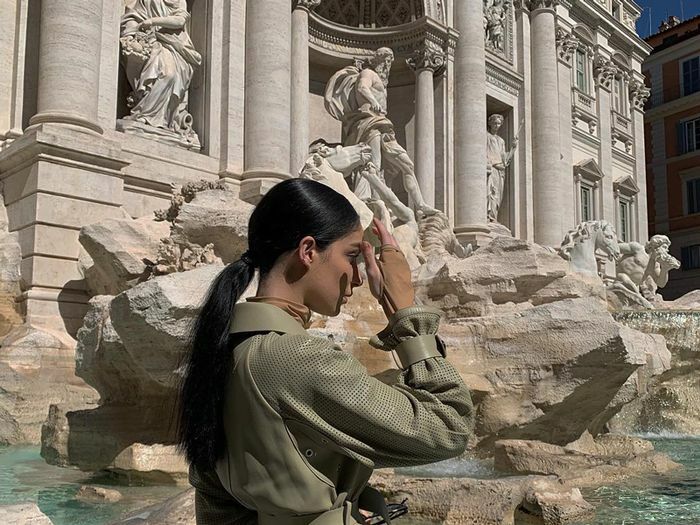 From fashion girl–approved ways to stay cool in the heat of the Roman summer to how to feel chic when winter hits, the following 20 pieces will see you through a trip to the Eternal City no matter what time of year. You can thank us later. March through May is one of the best times of the year to visit Rome, as the city is at an ideal temperature for maximum exploring (and the crowds are still at a minimum). So to make the most of the balmy weather, make sure you have a pair of sneakers, a wear-with-everything jean jacket, and a statement bag on hand. You'll be able to dress everything up with a blazer and pair of heels when its time to head out for dinner, or style them casually for an afternoon glass of vino. Rome in the summer is not for the faint of heart. There's no doubt that it is one of the most spectacular times of the year to be in Italy—as the thousands of tourists suggest—but be ready to sweat. Combat the 90-degree temps with frequent gelato stops and a travel wardrobe that consists of lightweight fabrics and sticks to silhouettes like Alyssa Coscarelli's below (though we'd suggest skipping dark colors where possible to keep things feeling even cooler). Unless you're headed to the Vatican, leave any other layers at home. Like spring, fall is an ideal time to pencil in a getaway in Rome (and Tuscany—hello, harvest season). The temperatures start to cool as you get into mid-October, so bring pieces like sturdy jeans, billowy tops, and buttery leather jackets that you'll be able to layer up or strip down depending on what the weather delivers that day. Though it can be rainy, December to February in Rome is mild compared to most parts of the Northern Hemisphere. The low-60s-to-mid-50s temperatures are the perfect opportunity to show off your sophisticated side by playing with a bit of texture as you stroll down Via del Corso. Add in leather trousers, statement heels, and a waterproof trench, and you should be set for whatever your itinerary holds. Need some more inspiration? Discover the eight-piece Italian-girl capsule wardrobe next.